Find A Haunted House Near You! Hauntfind.com is dedicated to the haunted house industry and the fun of Halloween. We exist to help people find a spooky haunted house in any state. All of us have heard of someplace near our homes that is haunted. It may be a cornfield, a house, or even a highway. For the most part, many of the stories that we hear are passed off as simply being entertainment and nothing more. Many people may think that haunted bed and breakfasts and ghost tours are just fake. There are some people that say that the spirits of the dead imprint on a home that they lived in and may have died in. This energy may come in the form of objects moving across the room by themselves, strange sounds, and shadowy figures as well as other phenomena that may be associated with ghosts and haunting. There are several homes throughout the United States that are thought to be haunted. Here are some of the most famous ones that you may or may not have heard of. 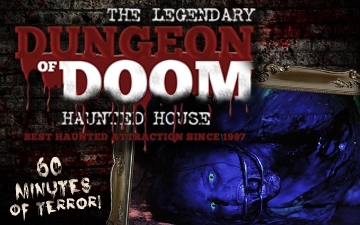 The Legendary Dungeon of Doom Haunted House is the Illinois and Wisconsin Longest running and Largest Single Walk-Thru Attraction. Statesville Haunted Prison has been widely considered one of Illinois’ best haunted houses for over 20 years. 150 live actors attacking you at every step.